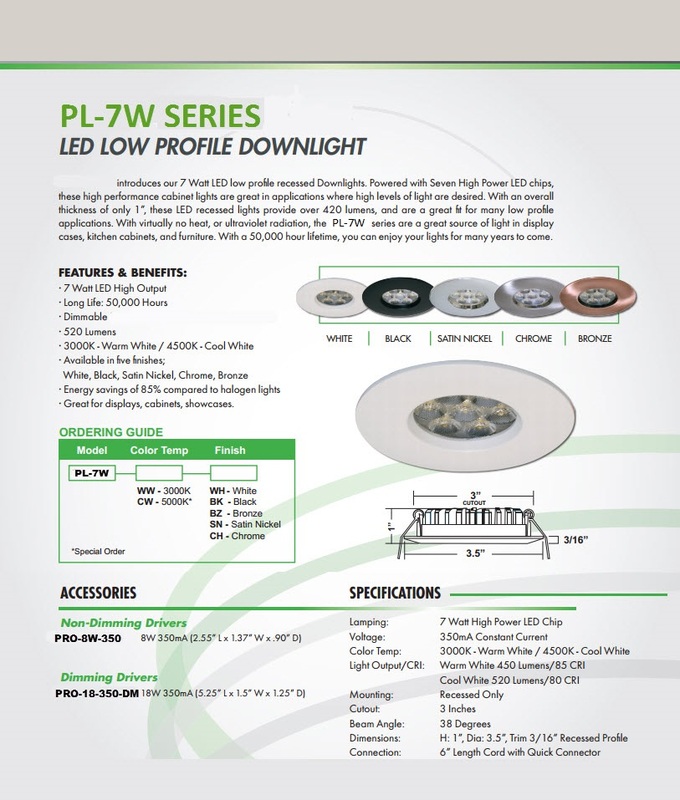 LAlightingstore introduces our 7 Watt LED low profile recessed Downlights. Powered with Seven High Power LED chips, these high performance cabinet lights are great in applications where high levels of light are desired. With an overall thickness of only 1”, these LED recessed lights provide over 420 lumens, and are a great fit for many low profile applications. With virtually no heat, or ultraviolet radiation, the PL-7W series are a great source of light in display cases, kitchen cabinets, and furniture. With a 50,000 hour lifetime, you can enjoy your lights for many years to come. Great for displays, cabinets, showcases. Like the brass finish, fast shipping, also got a discount. buy more from this website. Got this last monday, and i really like it. especially the white finish. fast shipping. Click the button below to add the Prolite LED 7W Recessed Low Profile Downlight to your wish list.